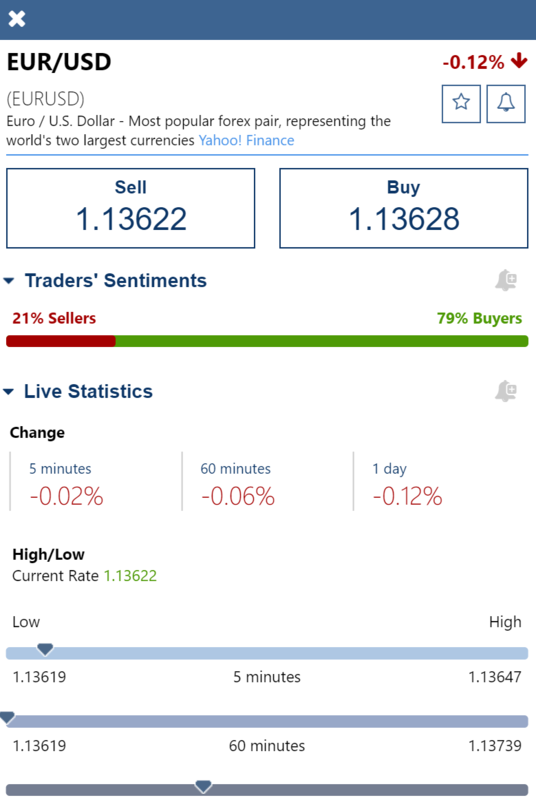 Plus500 has a simple, easy to use trading platform, the mobile one is especially well designed. The account opening process is fully digital and seamless. Spreads are competitive, and Plus500 has some innovative solutions, such as cryptocurrency CFDs. Plus500 has limited product portfolio, provides only CFDs. It has high financing rates. Some standard research tools, like recommendations, fundamental data, or news feeds are missing from the Plus 500 platform. We compare Plus500 fees with its peers, eToro and XTB. Plus500 trading fees are low. There is no commission, everything is included in the spread, the difference between the ask and the bid prices. Here is the verdict. Plus500 both stock CFD and forex trading fees are low. Plus500's yearly financing rates are high. Brokers charge financing rates if you hold a leveraged position for more than one day. Plus500 financing rates are only published on the trading platform, and the calculation method is not transparent. Plus500 can also change the rates anytime at its discretion. This can influence your trading fees very much if you tend to hold positions for longer. Plus500's non-trading-fees are average. Plus500 withdrawal fee is good. There are five free withdrawals per month. After that it is $10 or if it is less than the minimum withdrawing amount. Bank transfer withdrawals are always $6. Inactivity fee is high, after 3 months there is a $10 quarterly fee. Plus500 accepts customers from all around the world. There are only a few exceptions. E.g. you can't open account if you are a resident of US, Canada, Cuba, Iran, Syria, etc. Plus500 minimum deposit is €100 for debit/credit cards and €500 minimum for bank transfers. Plus500 has one live account type, and it only serves individual accounts, no corporate accounts are offered. If you want a fast and digital account opening, Plus500 is your broker. You can easily open your trading account within a day. After the online registration, you have to verify your identity and proof of residency. You can upload a copy of your ID/passport for verifying your identity, and a bank statement/utility bill for verifying your residency. You can open your account in several base currencies. It is not transparent what currencies are available, but according to the customer support even minor currencies are supported (we could open a Hungarian Forint account, too). You need to contact the support in case you want to change your base currency. Make sure you do this before you deposited money to your account. Plus500 deposit is free of charge. Plus500 withdrawal is free of charge for up to five per month. Beyond that, it is $10 for one withdrawal. This is competitive since many other brokers, like eToro, charges withdrawal fee. There is also a minimum withdrawal. It is $50 for Paypal and $100 for bank transfer and credit/debit cards. If you want to withdraw a lower amount, $10 charge will be applied. For withdrawal, you can use the same channel as at deposit. This offer is much better than at XTB, and in line with eToro. Plus500 provides only that the withdrawal can take a few business days. We tested credit/debit card withdrawal and it took 3 business days. Plus500 has an own-developed web trading platform. It is available in 30 language which is great. Plus500 web trading platform is clean, well-designed, and easy to use. As such, even a first-timer could navigate the app with ease. On the flip side, you cannot customize the platform. The login process is safe since you can use a two-step authentication. 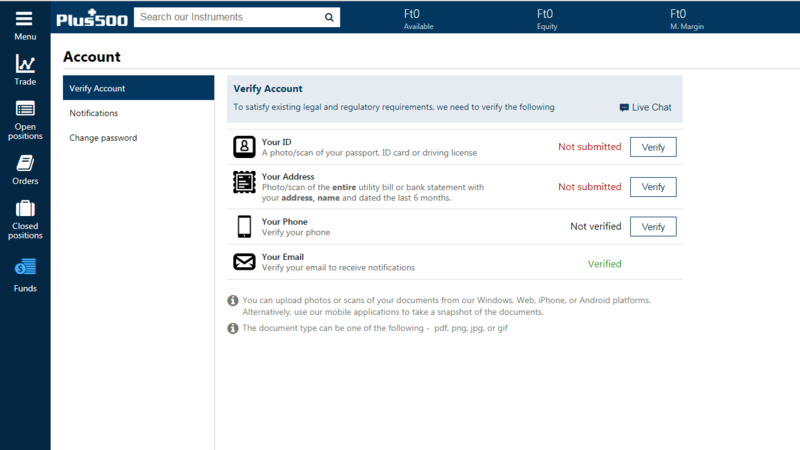 Plus500 also provides Google and Facebook authentication, which is quite convenient. You can find a short explanation of the order types in our guidebook. The alert let you know if the price of an asset reaches a level or changes x%. Additionally, you can also set up an alert if the Plus500 Buyer/Seller sentiment changes. Plus500 provides transparent portfolio and fee reports. It is clear how much overnight fees you paid. The status of your current portfolio is also clear from the upper bar of the platform. Plus500 mobile trading platform is well designed and user-friendly. At Plus500's mobile platform you will find the same functionalities as in the web version. You can download the mobile app for iOS, Android, and Windows Phone. You can also use your smartwatch, but we stuck to a conventional smartphone and tested the mobile iOS app. It was great. Plus500 is a CFD and forex broker. To learn more on CFDs read our CFD trading tips. Plus500 offers sufficient CFDs. It is wider than eToro's and in line with XTB's. 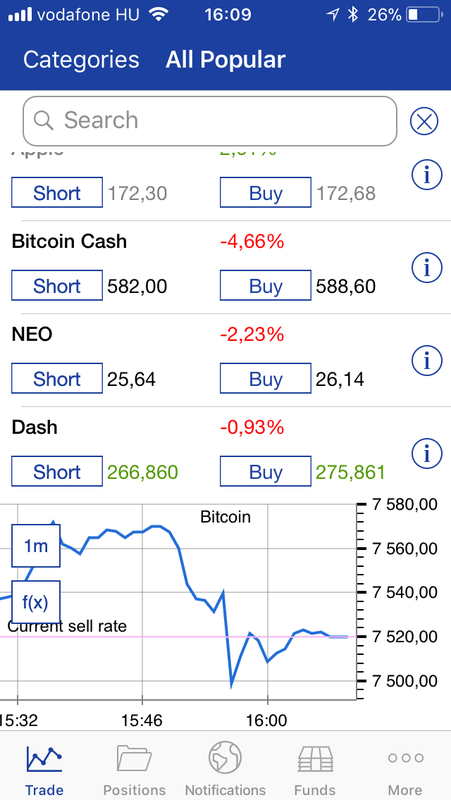 There are some cryptos, but less than at eToro or XTB. You can also trade with options on a few stock and stock index CFDs. 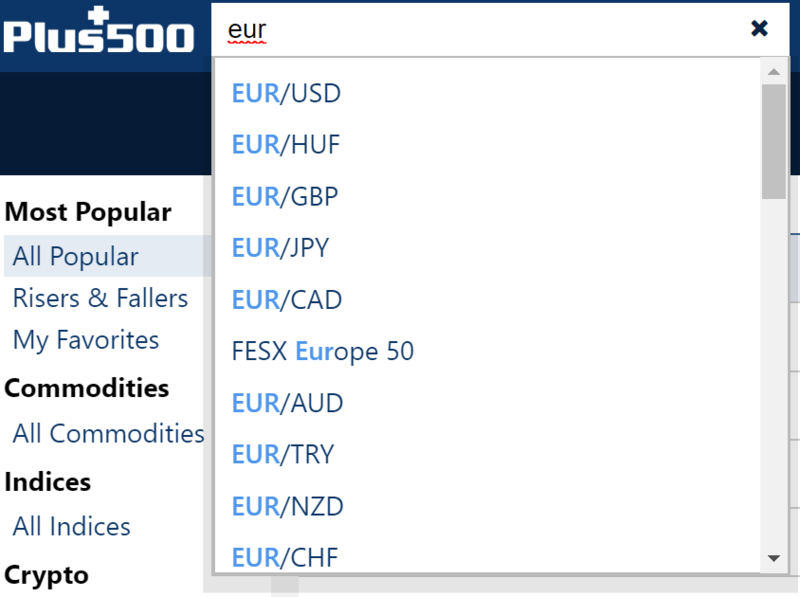 Plus500 provides limited research tools. It has good charting tools and a well-designed economic calendar. But, recommondations, fundamental data, and news are missing. The charting tool has good quality. There is a lot of indicators and editor tools. You can also save the charts. You will find a well-designed economic calendar, but will not find news or newsletter. 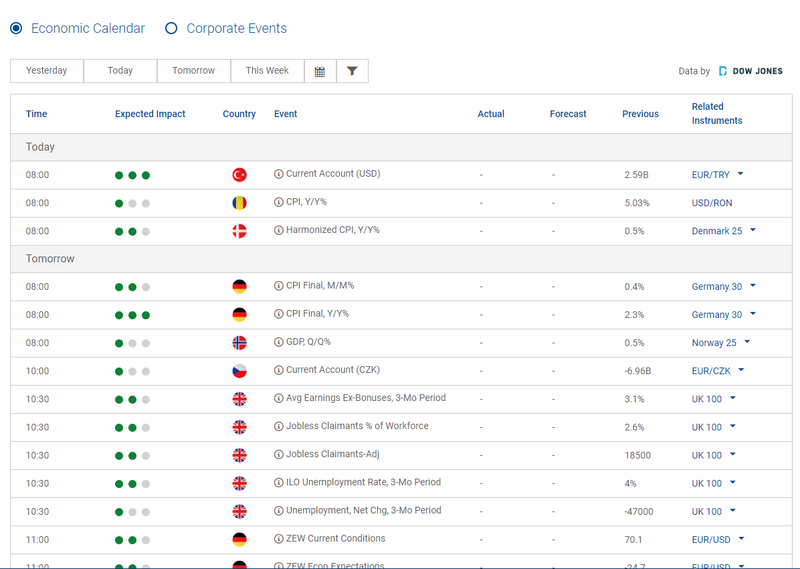 We liked that you can filter for macro events, company earnings, etc. 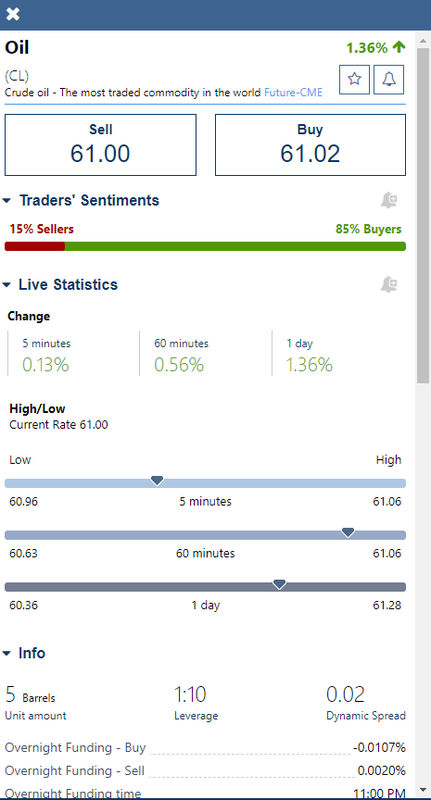 You can use the market sentiment tool which shows the proportion of the buyers and sellers at Plus500. Plus500 has a great customer support. Both the live chat and the e-mail support are quick and reliable. Furthermore, they are available 24/7. You can contact the customer service via live chat and email. There is no phone support. We tested the Plus500 live chat several times. It was always quick and reliable. For example asking about fees, they revealed all relevant fees, including the financing rates. After the conversation, you can rate your customer agent instantly, a good way to give feedback. The email customer support was also fine. They replied within one hour which is extremely fast in comparison with other brokers. The answers we got were relevant. On top of the customer service's quality, they are available 24/7. Not very common at other brokers. Plus500 only provides a demo account where you can practice trading before opening a real account. Plus500 is listed on the Main Market of the London Stock Exchange and is regulated by top-tier financial regulators like the FCA. Plus500 is an Israeli broker established in 2008 serving clients from all over the globe. Is Plus500 safe? To be certain, it is best to check two things: how you are protected if something goes south and what the background of the broker is. Plus500 operates a bunch of subsidiaries and depending on your residency, one of these subsidiaries will serve you. The investor protection amount you get depends on the subsidiary's country you are signing up with. For example, if you come from the UK, you will sign up with Plus500UK Ltd and get a £50,000 investor protection. Plus500UK Ltd is regulated by the FCA, the UK regulator. Plus500 also provides negative balance protection. Plus500 is listed on the Main Market of the London Stock Exchange, which is a big plus when it comes to security. Other aspects, such as ownership, company profitability, regulatory compliance, etc. are all transparent, clearly documented, and can be accessed in Plus500’s annual report. A financially strong parent company is a plus since it can supply the online broker with additional capital if this is needed. As of 9 March 2018, the biggest owners of the company were mostly big investment banks and asset management companies, like JPMorgan and Morgan Stanley. The biggest owner, Brighttech Investments had a 9.99% stake. Alon Gonen, one of the founders, was also among the biggest owners through Sparta24 Ltd.
Plus500 was established in 2008, so it has 10 years track record. The longer the track record, the better. Longer track record means the company was able to manage financially tough times, like the financial crisis. Plus500 operates on a market maker model. This means, when you are trading on Plus500's platform, Plus500 is your counterparty. If Plus500 defaults, it may happen that it cannot pay you and you can rely only on the investor protection. On the other hand, if you trade with exchange-traded products, like real stocks, your counterparty risk is eliminated by the stock exchange. Being listed, being regulated by top tier regulator, like the FCA are all great signs for Plus500's safety.